93 Feet East. 150 Brick Lane London E1 6QL Tickets on sale soon with some freebies for the speedy. 8pm-1am. 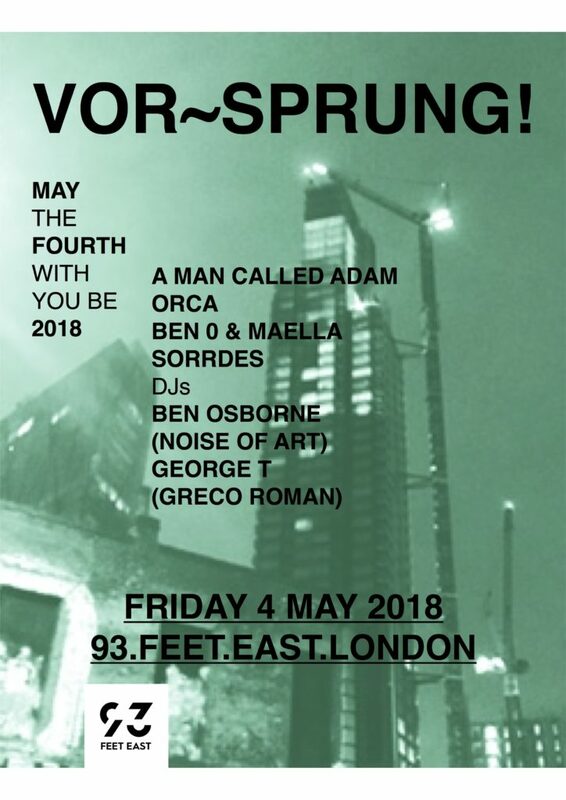 Live club night Vor~Sprung is fizzing into its debut night with a party celebrating the first new A Man Called Adam release in a decade and a clutch of new high calibre electronic acts. There are few bands that have been as involved in the development of UK dance music as A Man Called Adam. Their career has pioneered Acid Jazz, spearhead Balearic House and Chill Out and become the standard barer of UK House and nu disco. Formed in the mid 1980s by Steve Jones and Sally Rodgers, they became Gilles Peterson’s in-house band and released one of the first singles on the Acid Jazz label. Ironically the b-side was a house track and their first big hit, Barefoot In the Head, kick started the Balearic House genre. After the third band member, Paul Daley, left to form Leftfield, AMCA moved genres and became the figure heads of Chill Out – and the most constant feature of the legendary Café Del Mar compilations. In the late ’90’s they reappeared at the centre of London’s UK House/ nu disco scene and went on to define the characteristic sound of UK clubs going into the millennium. Then they split up – only to re-appear DJing unannounced together for the first time in a decade at the Camden Underground club night. Currently mining a new wealth of inspiration, it’s anyone’s guess what genre their next LP will launch. Ben 0 and Maella is a new collaboration between Londoner Ben Osborne and Prague singer Maella. As yet unreleased or (amazingly in this day) available anywhere online, one of their tracks caused a flurry of unanswered google searches when it recently cropped up on Amy Lamé’s BBC 6 Music show. Sorrdes is another new electronic act, this time plucked from the barren wilds of the East Coast. His music combines ambient pulses and pads with often deceptively caustic rhythm patterns. Rural England’s answer to early Detroit techno, if you will. BOrka, like it sounds, is a Vor~Srpung collaboration between Ben 0 and Orka that was first experimented with at the Jazz Cafe supporting UK electronic pioneers Radiophonic Workshop. The night’s DJ tag team consists of Ben Osborne and George T (aka Demure) . Producer, singer and DJ, George T has been described by Dummy magazine as Greco Roman‘s secret weapon – GR being Joe Goddard from Hot Chip‘s hyper cool record label.